Beyoncé demonstrated all the qualities of a true performer as she continued to sing with her hair got caught in an industrial-sized fan on stage in Montreal. Her waist-length curly hair became caught in the stage prop during a performance of Halo as she moved into the pit to be closer to fans. Her bodyguard and various stagehands acted quickly to free her from the device. Cringe! The show really did go on for Survivor singer Beyoncé who, despite looking slightly panicked as she clutched at her ‘Virgin Remy’ hair extensions, was perfectly on pitch throughout. Never failing to impress her loyal fan following, Queen Bey treated her five million Instagram followers to a special altered version of Halo after the show, too. 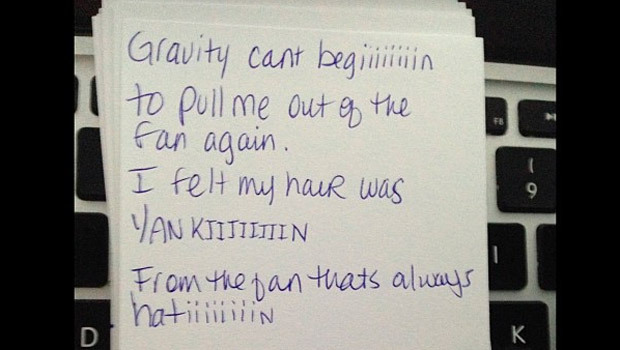 The humorous pen-and-paper note featured lyrics changed to include: ‘Gravity can’t begin to pull me out of the fan again.’ And it’s not the first time Bey has posted a handwritten gesture to fans. After cancelling a live show due to exhaustion for the first time in her career back in May, Beyoncé posted an apology note on Facebook to ticket holders of the rescheduled Antwerp gig. 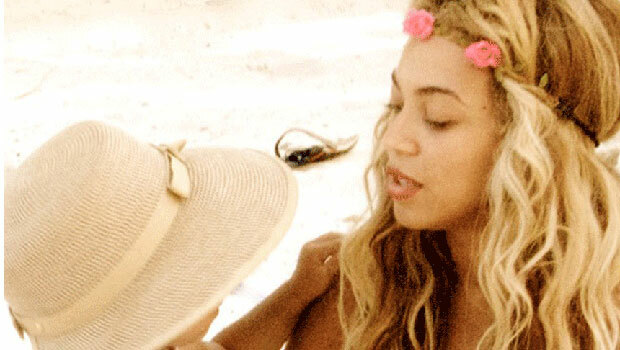 Beyoncé has invited the world into the more private side of her life in recent years. Where her relationship with 99 Problems singer Jay Z was previously shielded from the press, Bey has now chosen to publicise many personal moments in her life devoting time to her Instagram page, photo-filled Tumblr and personal website, which includes a news reel and world tour diary. So not only is she heartwarmingly candid, but even when faced with a terrifying hair disaster, she doesn’t even break a sweat. Queen Bey, indeed.